Young Norwegian star Edvald Boasson Hagen and Australian Simon Gerrans are among 10 foreign riders who will join new British squad Team Sky next season. Boasson Hagen is currently third in the UCI world rankings, while Gerrans has won stages of the Giro d'Italia, Tour de France and Tour of Spain this year. The announcement comes a day after six British riders, including Olympic gold medallist Geraint Thomas, were named. And there is speculation that GB star Bradley Wiggins could join them later. Team principal Dave Brailsford said: "It's another big step in building Team Sky, and it's very exciting to see the team take shape. "These international riders join a British contingent - a fundamental part of the team. What do you make of the team so far? "They bring huge experience from the Classics and Tours, real talent that we can develop, and key elements for a high performance team." The team expect to take part in the Tour de France next year, with the aim of securing victory by 2014. Sprint star Mark Cavendish confirmed on Monday that he will stay at Columbia in 2010, ending speculation he would ride for Team Sky. But he will lose four Columbia team-mates, including in Boasson Hagen and Sweden's Thomas Lovkvist, to Team Sky. 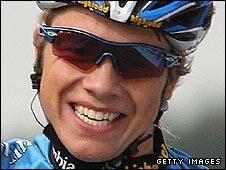 Boasson Hagen won two stages on last year's Tour of Britain but was not included in the squad for the 2009 Tour de France. "I felt it was time for me to try something new and see if I can reach further in my ambitions as a rider," he told Cycling News. "My main goals for the coming season are going to be the classics. I want to have a go at riding the Tour de France too." The new team, funded by broadcasters BSkyB, will be managed by Brailsford, the GB performance director who was responsible for delivering 34 medals at the Beijing Olympics and Paralympics. Having the top British cyclists training together should improve chances of success on the road at future World Championships and Olympic Games. Although only nine riders can take part in major tours, the squad will eventually number around 25. Welshman Thomas, 23, was the youngest rider in the 2007 Tour de France and won Olympic team pursuit gold in Beijing. The name of Wiggins, who was fourth in this year's Tour de France, continues to be mentioned, although he is under contract to Garmin Slipstream until the end of 2010. Garmin manager Jonathan Vaughters said recently: "I would have to be clinically insane to sell that contract." Kurt Arvesen - 34, from Norway; has won stages of the Tour de France and Giro d'Italia and will be a mentor for young riders; part of Saxo Bank squad that included 2008 Tour de France winner Carlos Sastre and Frank and Andy Schleck. John Lee Augustyn - 23, from South Africa; Barloworld team-mate of Thomas and Froome during 2008 Tour de France; has potential to be a great climber. Edvald Boasson Hagen - 22, from Norway; currently sits third in the UCI rankings, having won a stage in this year's Giro d'Italia. Kjell Carlstrom - 32, from Finland; a specialist climber, he has ridden all three Grand Tours and is a stage winner in Paris-Nice. Steve Cummings - 28, from Birkenhead; part of pursuit teams that won gold at 2005 World Championships and 2006 Commonwealth Games and silver at the 2004 Olympics. Russell Downing - 31, from Rotherham; winner of 2009 Tour of Ireland; one of the most successful ever GB-based professionals. Juan Antonio Flecha - 31, from Spain; has 10 years' professional experience, including a Tour de France stage win in 2003; known as a Classics specialist. Chris Froome - 24, born in Nairobi, Kenya; became British-registered in 2008; has completed two Tours de France. Simon Gerrans - 29, from Australia; has won stages of all three Grand Tours this year and the 2008 Tour Down Under. Greg Henderson - 31, from New Zealand; world scratch race champion on the track in 2004; has recorded nine victories with Columbia in 2009, including the Tour of Spain. Peter Kennaugh - 20, from Isle of Man; British Under-23 Champion who is dominating the Under-23 calendar in Italy; partnered fellow Manxman Mark Cavendish in madison at 2009 world track championships. Thomas Lovkvist - 25, from Sweden; a five-year pro who wore the leader's jersey during this year's Giro d'Italia as part of Columbia HTC squad and could contend for overall tour wins. Lars Petter Nordhaug - 25, from Norway; former mountain-biker who switched to the road and became Norwegian national champion; runner-up to Russell Downing in the 2009 Tour of Ireland. Morris Possoni - 25, from Italy; wore the best young rider jersey during the 2008 Giro d'Italia as part of the Columbia squad. Ian Stannard - 22, from Chelmsford; came third in 2008 Tour of Britain and rode 2009 Giro d'Italia. Geraint Thomas - 23, from Cardiff; youngest rider in 2007 Tour de France; won gold in team pursuit at Beijing Olympics.